Having been a police officer I trusted in the legal system. I was so wrong, the problem is our legal system is nothing more than a false image. An image of trust, integrity and justice which really does not exist. The fact is I had to become a victim to see through all the lies and hype. The first surprise are the costs involved in seeking justice. Why is it something they claim we all have a right to is one of the most expensive businesses in America today? What you end up finding out is our legal system is not about justice it’s about money. I watched lawyers blatantly lie to legally steal. Yes get that straight, it’s no different than someone breaking into your home or holding a gun to your head getting you to give up your possessions. Yet when it’s done before a judge in a court of law none of that matters. 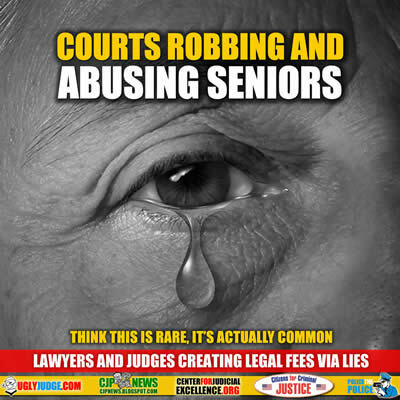 What’s worse is these totally dishonest lawyers and judges do this to the weakest, defenseless people on earth our seniors. It’s a game where they hide behind “We’re protecting them” yet they’ll dump their on the street the moment the money runs out. If this was about protecting or serving then money would have nothing to do with it. It’s a scam, a lie and the biggest business in America today. Judges hide behind marshals, court room walls and immunity of a black robe. They have no morals, shame or empathy and they rarely wish to see their victims. While not all judges and lawyers commit these heinous crimes and abuses the number of them who do is staggering. Where it get’s really obvious that the system is broken is when you try and report those involved. How it’s all ignored, delayed and then even protected. Victims are often extorted by the court when they go public. Life savings are given away like candy, control of someone’s life is granted to the worse people. Those people usually are the ones who bring the victims into the court system where the vultures take their turns sucking them dry. Senior homes billing thousands each month, lawyers forced upon the victims by the court who are not directly paid by the victim. Probate investigators who know the point is they only get paid if it all continues so why expose it to stop it? When I thought I had it bad I found social media and was astonished that I was not alone. In fact this is going on in every court in America today, every city, state and county. It’s too easy and almost impossible to expose. Even big names are sucked in like Mickey Rooney and Britney Spears. Because it’s about control, controlling the money of others and stealing it from them. Imagine one day you wake up and are carted away to a medical facility where someone has reported you as mentally ill. You’re really not, you’ve just been over medicated. Yet you’re sluggish, weak and unable to respond. The next thing you know the facts have been manipulated and perjured and you’re locked in a home where the drugging continues. A judge never sees you and everyone who get’s involved will be generously rewarded. All they need to do is hide behind the lie “We’re protecting them” and act as if their doing so. The fact is your the only one whose not being protected. The person who becomes your guardian or conservator takes control of your life. Makes all the decisions and reports to the court. Now with the court behind you they have added immunity and powers. The option to demand forced medications, a locked facility and how your life savings will be spent. The spokes person Lee Pullen for Santa Clara County who appears in the video below is using the “false image” that they’re just protecting. But what you don’t see it how they’re really isolating, over medicating and liquidating the victim. They’ve destroyed this woman’s life keeping her loved one from her. She no longer has any rights even if they claim she does because the judge does not enforce the law or rules. It’s a business, a scam and employs the lowest form of human trash who prey on the weak, disabled, defenseless and innocent.